Bullets come from behind to best Bears: Gburg football wins conference opener | The Gettysburgian. 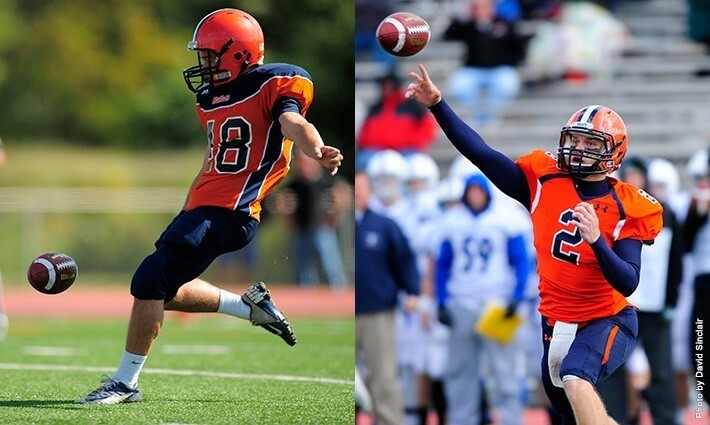 Seniors Robby Fay (left) and Sam McDermott earned weekly honors from the Centennial Conference. Photo Courtesy of David Sinclair. After an hour delay for inclement weather on Saturday, September 12, the Gettysburg Bullets took the field against Ursinus in the conference opener at Shirk Field, Musselman Stadium. Family, friends, and fans stuck who around in the rain, hoping that the lightening delay would be lifted, were rewarded with an intense match-up. Going into the contest, the Bullets knew they would have to work hard. “The team’s mentality was to carry all the positives from the first game and all the preparation in practice that week into the game,” shared Miller. Miller posted 7 tackles against the Bears. The Bullets put up a tough fight against the Ursinus defense, but were unable to put any points on the board in the first quarter. The Bears led 0-5 after a field goal and safety. Ursinus put up another field goal at the start of the second quarter, and the Bullets didn’t make it into the end zone until the very end of the first half. Senior quarterback Sam McDermott found senior Travis Andrews in the end zone with under 3 minutes left in the second quarter. The two-point conversion was no good. Senior kicker Robby Fay’s 24 yard field goal attempt in the last seconds of the half was blocked, and the Bullets left at the half down 6-8. Fay, Special Teams Player of the Week, averaged 60 yards on five kick-offs and just under 40 yards on six punts. McDermott, Offensive Player of the Week, led the offense with 3 touchdowns and a career-high 269 yards. McDermott also threw 3 touchdowns against Bridgewater, where the Bullets came out on top 49-10. The Bullets re-entered with game with renewed drive and enthusiasm, fighting the tough Ursinus defense and putting up 85 yards on 16 plays. Sophomore Ryan Thompson received two touchdown passes from McDermott in the third quarter, and both two-point conversions were good. Ursinus tried to swing the momentum of the game in their favor, and was able to capitalize on a touchdown on the Bullets’ 1-yard line early in the final quarter. Gettysburg, up 22-15, seemed in control until Ursinus recovered the ball on a Bullet fumble with 1:34 left on the clock. Senior defensive back Brian Calatozzo intercepted the pass on the next play, setting the Bullets up on the offensive 28. Two knees on the next snaps ended the game with a 22-15 Gettysburg win. This was the second of co-captain Calatozzo’s interceptions this season, in addition to his 10 stops against Ursinus. Senior defensive back Michael Kornegay posted 13 tackles for a personal best, and senior co-captain Kodie McNamara surpassed the 300 mark of career stops with 20 tackles in the Ursinus match-up. The Bullets are looking to continue their victorious streak as they move forward in their season. Gettysburg will travel to Juniata College on Saturday, September 19th for a 1:00 p.m. game.